Our finished basement was our playroom, but there was a problem: my kids didn’t want to play in the basement! 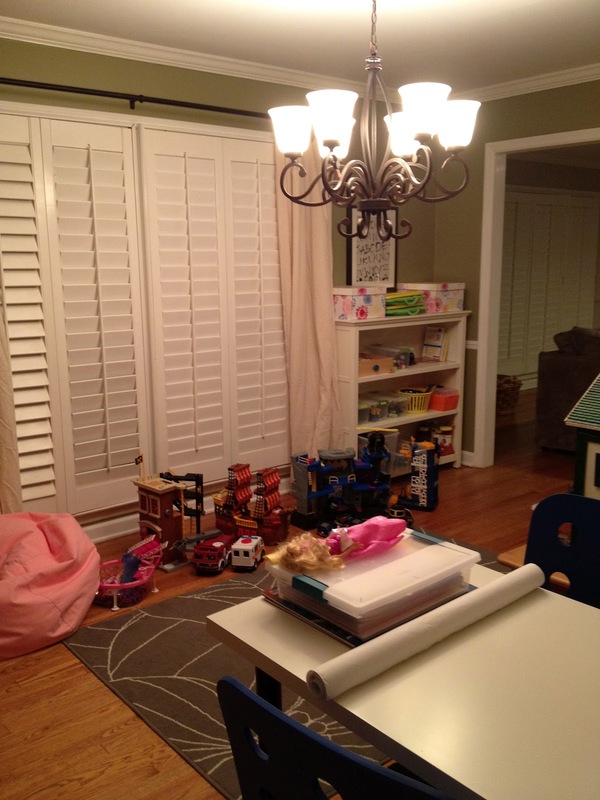 A friend, who is converting her dining room into an art/craft/homework room, gave me an idea…why not turn our seldom-used dining room into a playroom? Genius. Pure genius. 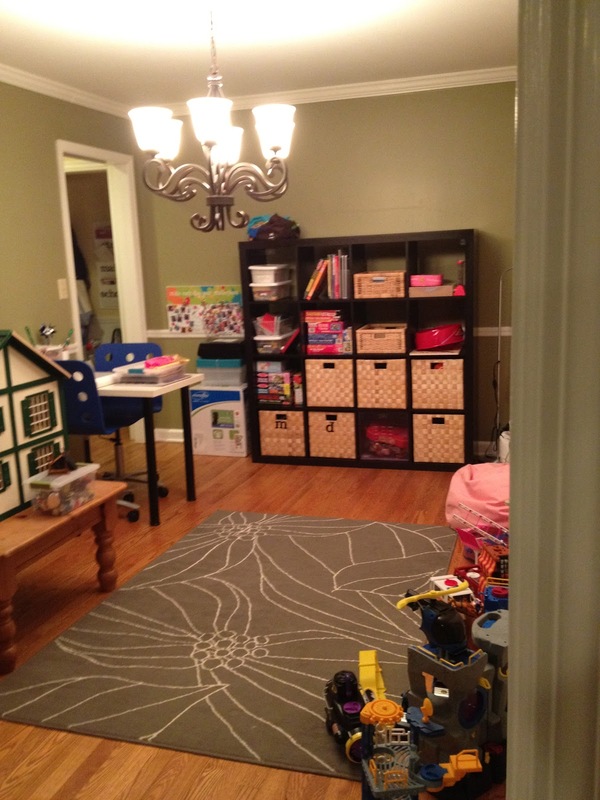 Here’s how to turn a dining room into a playroom and finally put a lonely room to good use! 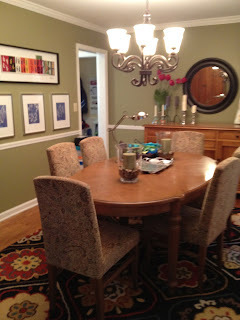 Now, I have to say: I loved our dining room. 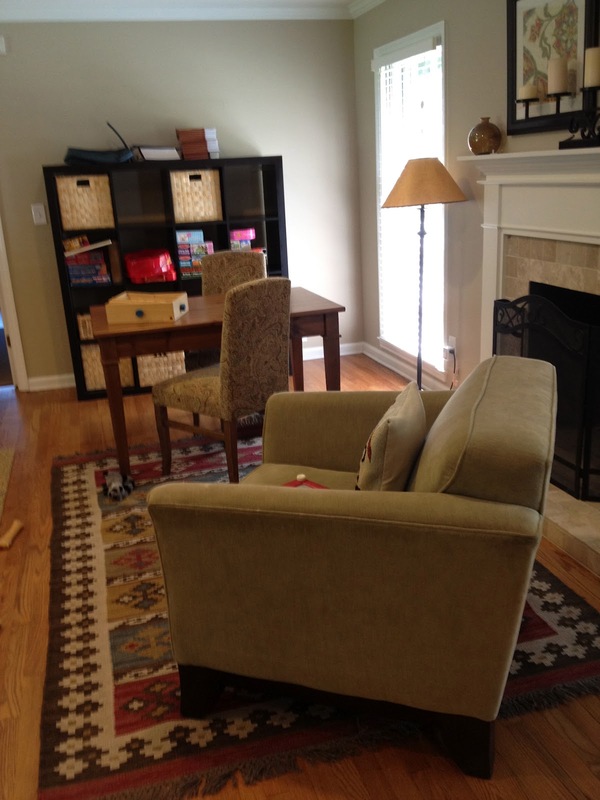 I put the whole thing together – paint, rug, table, chairs … the whole shebang. And I loved it. But, you know, we aren’t formal dining people. We used our dining room maybe once or twice a year, and otherwise it was just used as a storage room. 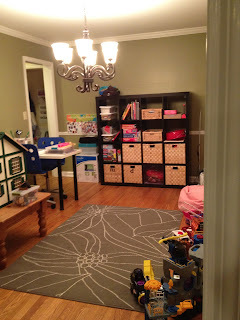 After thinking and measuring and thinking some more, I decided to do it – put the dining room in the living room and put the playroom in the dining room. The kids and Dear Husband were out of town, and I was brain dead from a weekend at our retreat for work, so this seemed like a good thing to do. I changed the curtains – the dining room had rust-colored silk tone-on-tone curtains. The playroom now has curtains I had bought (a while ago) in the as-is room at Ikea for $10 each. I’m going to tie them back with some green ribbon. This is the view from the living room. I moved the rug from the guest room/my office in there, as well as the Ikea Expedit toy storage from the living room, M’s doll house (formerly my doll house), the art table and art supplies from the basement, plus most of the toys. Oh, and two beanbags and a lamp for a reading nook (I love nooks). The art table is on the left, with two chairs (one for each kid), plus Ikea white ceramic planters holding pencils, colored pencils, scissors and markers. The reading nook in the corner. View from adjacent corner (dining room entrance). Not too bad, right? 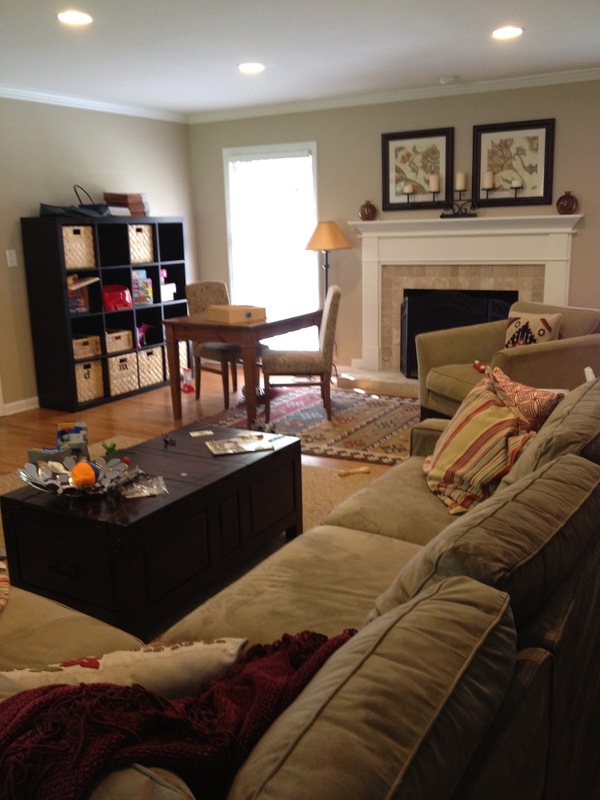 I actually really like it, and we’ve already used our dining room table more in the last week than we did all last year! Double win! And, most importantly, the kids love their new play space. They got home today and went right in there and started playing – giving me time to make banana bread and dinner with nary a peep from them. It was, well, awesome. Thank you for listening and for your ideas that helped inspire me. I’d love to know what you think! « "Yep. You broke it." It think it looks really good! Also, i think that formal dining rooms are sort of over-rated. 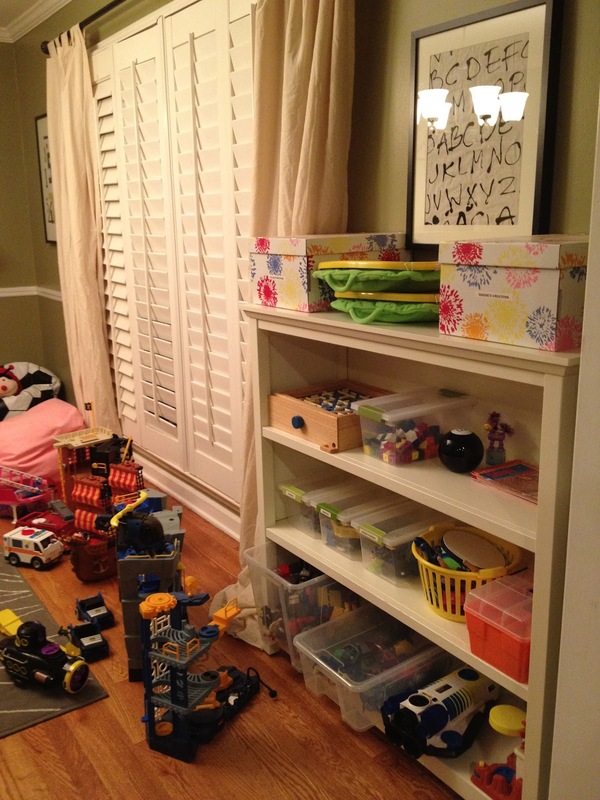 We don’t have one in our new house and instead use the parlor as a playroom for Daisy and Elliot–best use of space ever. They feel like they are close enough to whatever else is going on and I feel like they are safe and contained(ish). You guys should come over!